SodaStream Fizzi has an average rating of 3.71 out of 5 based on 7 user reviews. The SodaStream Fizzi allows you to make your own sparkling water at home whenever you want it. You can start with ordinary tap water, your favorite bottled water, or add the flavorings you like. Whether you drink a lot of sparkling water or just the occasional refreshing drink, with the Fizzi, you’ll be able to enjoy it a fraction of the cost of store-bought brands, and without the hassle of shopping and carrying heavy bottles home. SodaStream has been making products like this for some time, and the Fizzi is one of their most popular. It’s a small kitchen appliance with a tall, slim, space-saving profile at only about 6x8x18 inches, so you can store it easily or keep it ready on your kitchen or office without it getting in the way. You could even pack it away to take on vacations or family outings. It can be used with a variety of different bottle sizes, from party-sized to handy .5 liter. If you’re not sure about compatibility, SodaStream’s website has a chart on what bottles will work. The Fizzi’s handsome black design is surprisingly lightweight at 6 pounds. If you like, it can often be found in white, as well. It requires no electricity or batteries, just a pressurized CO2 cartridge, so it will carbonate your cold drink on-demand in just a few seconds, every time. It features SodaStrean’s Snap-lock design so that you can quickly and easily attach bottles with an air-tight seal. Then all you do is hit the carbonation button, usually three-to-seven times depending on how much carbonation you want. It also includes a silencer valve to keep any pressure noises down to a gentle puffing. SodaStream makes great products for households that love their sparkling water, and the Fizzi is one of the best they’ve come out with. It’s simple to use and the more you use it, the more savings you get from it over bottled brands. Getting quality sparkling water at less than half the cost you’re used to is definitely the major advantage. SodaStream makes more expensive models, but the Fizzi is the most economical. With it’s slim design, simple use, and attractive styling, you’ll have no problem leaving it on the countertop, but be sure the bottle and its liquid are COLD before carbonating for best results. The user manual is very basic and consists mostly of pictures, but no worries. It’s very easy to set up and use. You should be able to go from delivery to a glass of seltzer in a few minutes. And if you opt for the 60-liter carbonation option, you won’t have to worry so much about changing/running out of CO2. The Snap-lock design for attaching the bottle is a simple front-facing, tilt, insert, and clamp design that works smoothly, and which a lot of similar products don’t have. Those force you to screw in threaded bottles by hand, which can mean leaks and spills. The push-button CO2 release is another nice feature, but you may have to experiment a little because there’s no way to tell in advance how much carbonation you’re getting. It’s not foolproof. If you like a strong fizz to your drink, it’s easy to over-carbonate and lose soda due to excessive pressure. High pressure also makes it a little more trouble to get the bottle off. It pays to release the bottle carefully. And bear in mind that it is made primarily of plastic, so it won’t take much abuse for very long. Otherwise, you won’t get a tight seal even with the Snap-lock. Still, a SodaStream product usually lasts for years, and this is a good one. 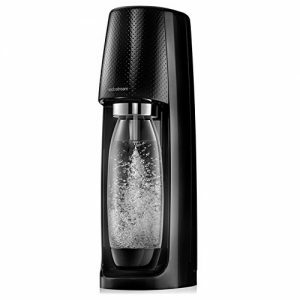 The SodaStream Fizzi does exactly what it’s supposed to do, which is make good sparkling water easily and quickly. You can add syrups, fruit juice, or flavors to come up with any type of soda or seltzer you want. Keeping your recipes healthy is also a huge improvement over sugary store brands. The Fizzi is so handy around the home that even if you weren’t a big drinker of sparkling water before, you will be. And not only is more water good for you, but you’ll enjoy every sip with the SodaStream Fizzi. The SodaStream is basically easy to use and easy to insert the CO2 cartridges. However, I quickly learned that you cannot overfill the bottles or they will leak. The flavor samples are O.K. But, they are a little weak for my taste. I prefer the flavor powders. Our family loves drinking sparkling water. So, it made more sense to have the SodaStream and make our own as opposed to continue spending the money to buy it at the store. The device is so simple to use. I had my Fizzi up and running in a matter of minutes. It is also just the right size to fit on my countertop and so pretty too. Each CO2 canister contains enough gas to carbonate 60 liters of water. The tilt-and-lock bottle holding system is also so much better than the twist-load options that are used on soda makers models. I also like the fact that I need merely to push a button to select the carbonation level that I want. I went ahead and bought a few replacement bottles so that I could make sparkling water to keep in the fridge. I love this product. I am on a special diet, so I cannot drink any of the readily available diet sodas. The Fizzi is perfect. I just add cold tap water, a little lemon juice and have a refreshing beverage without the added sugar or artificial sweeteners. The SodaStream gives me the bubbly fix I need. Our household loves the SodaStream. At first, I thought they were only good for making pop. But, I soon found out that the machine actually makes sparkling water. The Fizzi saves us a lot of money from having to buy it at the store. We started experimenting by making our own flavored water using natural fruit. I also splurged and got a couple of extra CO2 cartridges to have in reserve. This way we do not have to rush right out to get one refilled. We still have plenty of CO2 and can refill the rest. I am so happy with this machine. It is so easy to use. Initially, I could not get the water to carbonate properly. I soon learned that using cold water is the trick. Hold the carbonation button down and release it slightly to keep pumping in the gas. When you hear the puff, the process is done. Repeat as desired for the right carbonation level. It now costs me less than half to have homemade club soda at home. I also have the cartridge refills delivered. So, I am no longer taking them to the store for an exchange. So, the SodaStream saves me time and money. I am not sold on the snap-lock bottle hold design. I am not sure what I am doing wrong. I know I am not putting in too much CO2. I typically use three puffs at the most. I pull the bottle and wait for the release. But, it seems to take too long and still splashes water when released. Buyers beware of where you get your model. My first SodaStream came with a miniature CO2 cartridge. You won’t be enjoying sparkling water for long. I added to my collection by buying another SodaStream that came with a full-sized, 60-liter cartridge. I have since decided to keep a number of backup CO2 cartridges in reserve to go with each of my soda makers.